Written by Marine veteran Clay Hunt (1982–2011) on Jan. 17, 2011 at 11:49 p.m.
On March 14, 2007, laying in the prone outside of Fallujah with a SAW pulled into my shoulder, a sniper round took my left wrist out from underneath my chin and my life was changed forever. No, wait, let me back up. On March 11, 2007, pinned in the driver’s seat of my truck with RPK rounds pinging off the bulletproof glass next to my left ear, and no way to get to my A-gunner who lay dying in the street 20 yards in front of me, my life was changed forever. Wait. Let me back up one more time. At dusk on February 18, 2007, monitoring our radio on top of an AMTRAC 15 clicks from my best friend’s squad, I heard that my bunkmate had been killed, and my life was changed forever. That was the moment I realized that we weren’t invincible. That’s when it all started, I guess. Nothing has been remotely the same for me since that day in February when Blake was killed. I went back to my hooch when my squad got back from our mission the following day, and all of his things had already been put in a metal box and sent away, back to his mom, I guess. He had gotten the bottom bunk that didn’t have a fluorescent bulb next to it, so I moved all of my stuff down and slept in his bunk for the next 3 and a half weeks until I got shot. I think I just wanted to be closer to him, I guess. But I couldn’t — he was gone. patrols, because they were in different squads. They even looked alike. It’s weird to think about now, really, I still see their faces when I see a skinny young Jarhead with no hair these days. Sometimes I have to actually do a double-take just to make sure it’s not one of them. But back to the story. Dawn broke on us March 11th, with the birds starting to chirp, then the music from the mosque nearby came on for a call to prayer or for Jihad—I couldn’t tell which—and then the sun finally started to break the horizon. My team was on the roof of a building our platoon had been running patrols out of for the last 3 days, providing security. It was me, my TL Mike, Layton, and Nathan. I’m the only one left, but that’s an entirely different story, because we lost Mike and Layton the following year in Afghanistan. We were up there while everyone was preparing to move out, back to our FOB a few clicks away, and it was a beautiful morning. I still have a couple photographs to prove it. About 1100 or so, the platoon was finally ready to move, so we all loaded up. I was always in a different truck from the rest of my team, I can’t really give you a good reason why, other than I had a Humvee “license” and they didn’t. Whatever. We started to move, with my truck and one other lagging behind for security as the platoon took a sharp right down Reds, back towards Mobil. I got told over the radio to stay put and cover the canal crossing because there were some shady looking dudes that the first three trucks had spotted hanging outside the barbershop on the corner, and they wanted to go question them—it was a known insurgent hangout. So I’m staring out across this canal, wondering what the hell is going on because I can’t see the other three trucks, and the beautiful stillness of that morning was shattered as all hell broke loose. A few seconds later I got the call to push up, and floored it around the corner, straight into a full on ambush. Nathan was lying in the street; he had taken one through the throat from a sniper, which was the kickoff to this crazy game. We were taking fire from three set in RPK positions, but the fury we unleashed from our turrets was vicious—the enemy called it quits after about 20 minutes, and we were able to get Nathan on a bird, but he left us as he was in the air on the way to the OR. I’ll never forget seeing Jake and three others carry him onto that bird on a stretcher. It’s a scene that plays on repeat in my head nearly every day, and most nights as well. wondered what he would say about me if I was gone. Immediately I realized I couldn’t think that way, not right then, so I picked my head up a little, refocused on the road I was covering, and then my wrist disappeared out from underneath my chin. I was on my way to the hospital within 20 minutes, and was back in California on leave a week later. I went back to combat in Afghanistan as an 0317 Scout/Sniper a year later, but that’s not what I want to talk about. I want to talk about how I’ve dealt with the PTSD that plagues me after those few months I spent in Iraq in ’07. I want to tell other vets who are struggling with the same feelings and experiences as me just how I deal with it, so that they know they’re not alone. My physical wounds are unnoticeable, and I quickly learned how to deal with the pain that is constantly in my wrist, just by changing the way I use my hand—push with a closed fist and try not to do anything that makes my hand bend backward. The mental wounds are far more apparent and have proven much more difficult to deal with, but I have figured out how to make them hurt less—and not with drugs or alcohol like so many vets I know do, like I used to for a time. I work out A LOT. I spend hours at a time on my bikes, whether it’s mountain biking or road cycling and have been practicing yoga for the past nine months. Exercise like that where I am working hard but steady, for long periods of time, releases certain chemicals in my brain that do more to relieve anxiety and stress than any pill the VA ever gave me. I could try and explain it better, but I’m not a neurologist, so I don’t really have the vocabulary. questioning why Nathan died and I didn’t. I found it in Team Rubicon, the organization that I am a part of that my friend Jake started by calling on me and eight others to respond to the earthquake in Haiti, to provide aid to those who so desperately needed it. Clay was an original member of Team Rubicon, providing aid in the immediate aftermath of a 7.0 earthquake in January 2010. I made my way down to Port Au Prince about 36 hours after the others had arrived, because I had been at my stepbrother’s wedding and couldn’t leave my family. As soon as I got home, I booked a flight to Santo Domingo, D.R. and that was as far as my planning went. How I found the Team amidst all the chaos is a story in itself, but I’ll never forget the relief I felt when I found the Team and they needed another set of hands. I found more there in Port Au Prince than I knew I had been missing. I cannot tell you how good it feels to be able to go into a rubble strewn city in a third world country, and to be able to do good without having to worry whether or not everybody around is about to start shooting at you. 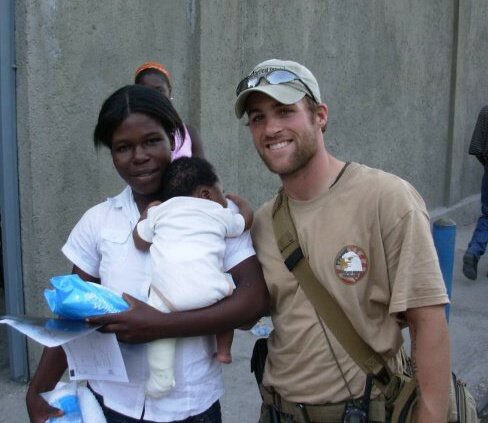 I found a renewed sense of purpose within myself that has been missing since I separated from the USMC—another way that I can serve, and for a cause that I truly believe in: helping to bring medical aid and assistance to people that are suffering, and who have no access to medical care. I found myself in the company of a band of brothers once again, which has been absolutely priceless to me. With their help, I was able to treat and to help provide reassurance to the many patients I saw—whether it was just dressing changes, casting fractured bones, wound-cleaning and care, or setting a young man’s broken arm so it will heal correctly. I was constantly challenged, and was consistently able to overcome those challenges due to the help of the men and women who I found myself working alongside. I think the one thing that will always remain with me from our missions to Haiti, and then to Chile when that earthquake happened, is the gratitude I’ve seen in the eyes of our patients. Every single one of them simply could not believe that these young Americans had come to help treat them, and that we didn’t want anything in return. 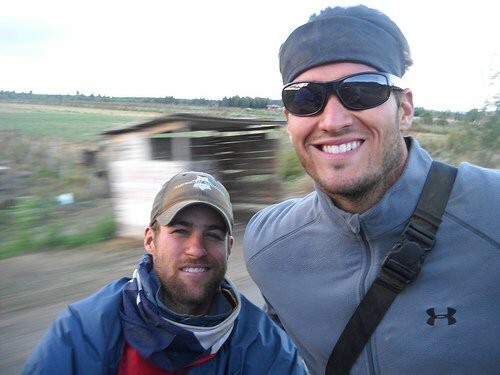 Clay and Jake deployed to Chile to provide relief in the aftermath of the earthquake in 2010. The smiles I saw on hundreds of children’s faces, and the thanks given to us by grandparents, brothers, sisters, mothers and fathers means more to me than any amount of money someone could ever throw my way. The fact is, the world truly needs people like us—people who have a desire to serve, the willingness to put one’s self in harms way, and who are content with being paid, very little or not at all. I’m not talking about myself or Jake right now—I’m talking about nearly every member of the US military I have ever met. Continue to serve, even though we have taken off our uniforms. No matter how great or small your service is, it is desired and needed by the world we live in today. days, and that is exactly what we do at Team Rubicon. While most watch the suffering of the world on their TV, we ACT, rapidly and with great purpose. Not counting the cost and without hope for reward. We simply refuse to watch our world suffer, when we have the skills and the means to alleviate some of that suffering, for as many people as we can reach. That is the essence and spirit of Team Rubicon, and that is why I am both humbled and proud to be able to call myself a part of it. 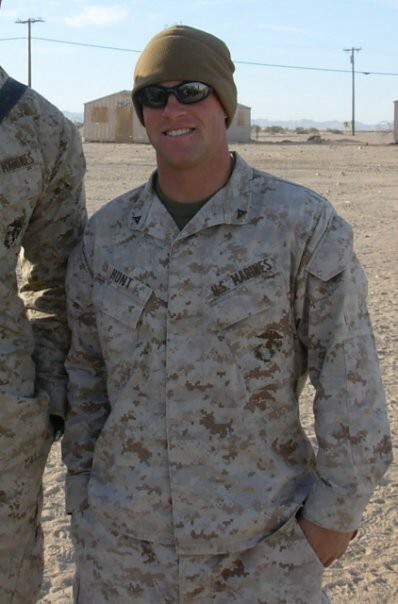 Clay Hunt served in the Marine Corps with Team Rubicon co-founder Jake Wood and deployed in the same section to both Iraq and Afghanistan with 2nd Battalion, 7th Marines. 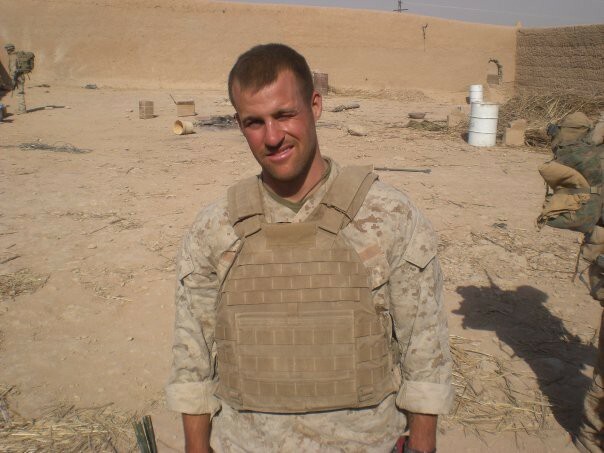 Tragically, Clay took his own life in March 2011, but his story has inspired many others to find a new purpose, a new mission through Team Rubicon. If you or someone you know is struggling, learn what mental health resources are available. We can combat suicide as a community.